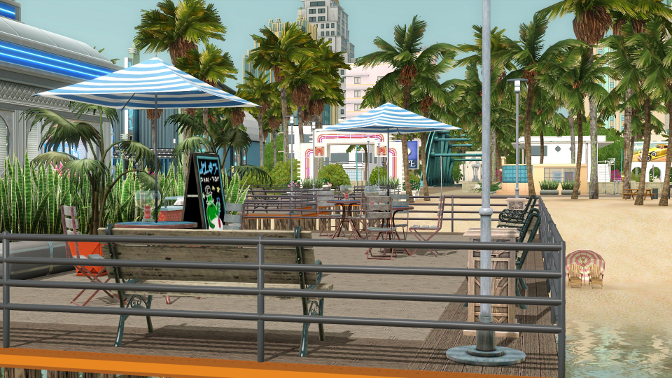 Roaring Heights has a spectacular look that is eye-pleasing in every area. It uses great textures, which blend together very well - even the dirt texture is applied in an appropriate way that only makes the world look better rather than worse. I really like how the city area looks from close up, and the beach looks like a good mixture of being a place where bustling activity takes place, and a relaxation spot. Can you believe this is not a rabbithole? The area where the world really shines is in the pre-made lots. I can honestly say that the lots in Roaring Heights are some of the best I've ever seen in The Sims 3. They have an extensive amount of detail put into them, are amazing places to send your Sims, and a huge inspiration for builders. My personal favourite is the Luminous Bar venue, shown in the screenshot above. I thought it was a rabbithole at first, and was actually surprised when I clicked it and found it was a real lot! Huge congratulations to the gurus who created the lots, you are amazing! I'm not a huge fan of the CAS content, it's just not my style. 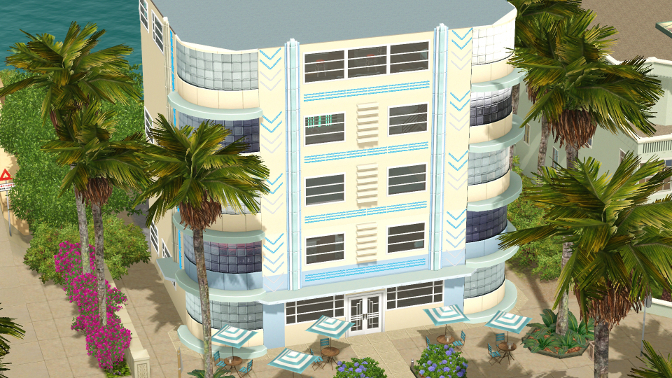 However, if you're a fan of 20s-style content, you might be interested in the CAS content. 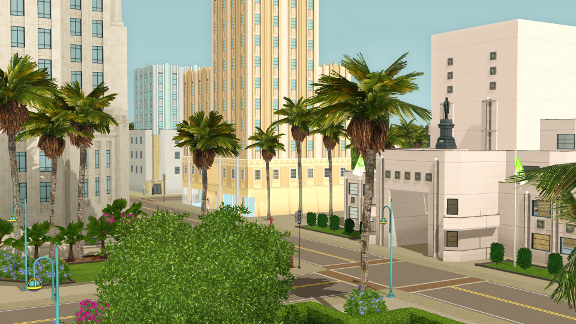 Roaring Heights comes with great new build and buy content. My favourite objects are the curved windows, which are the closest we've ever got to curved walls! I also really like the fancy new wall and floor content - all the more variety to choose from. 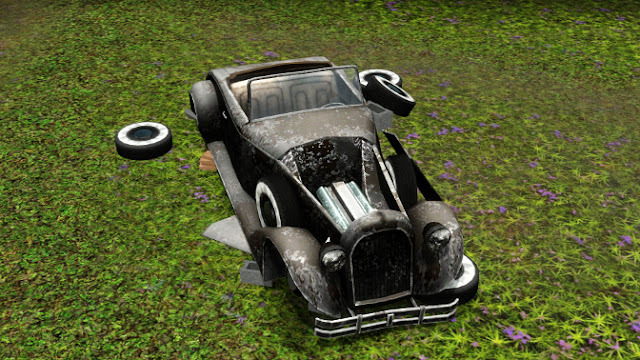 The Fixer-upper car is a great choice of premium content. Not only does it provide the much-missed car interactions, but the radio feature makes going to community lots more fun. I've checked, and yes, it can hold more than two Sims, though you'll only be able to see two of them. NOTE: If you can't be bothered to wait the length of a Sim day to fix up the car, you can use NRaas Debuger to fix it up quicker. To do so, click the car, select "NRaas" then "DebugEnabler" then "DEBUG_MakeNearlyFinished", and then it will only take a couple of sim-minutes to complete it. The reason I don't give this a full 10/10 is because I believe there should be a cheat or something to get it fixed up quicker. Although I quite like the challenge of fixing it up, I might sometimes want it pre-fixed, for example when giving one to Sims I don't plan on playing. The mod works, but mods shouldn't be required to add features that should have been included in the first place. without having to renovate every lot. The Gold edition contains SimPoints which can be used to buy The Boardwalk venue, which I'll probably do a separate review on.